To my great amazement, several commercial puff pastries are vegan – so once I decided to make Beef Wellington as the main dish for my 2018 Christmas Eve Dinner, I knew it wouldn’t be hard to find a vegan version of Wellington. There were actually many different versions, with all sorts of fillings, but this recipe for mushroom Wellington looked and sounded amazing – and my vegan daughter is very fond of mushrooms. She was very, very happy with it and ate all the leftovers. I followed the recipe closely, though I used a very small amount of baby spinach, given that she doesn’t like it. If you want to follow the recipe exactly, use 10 1/2 oz (though really, that’s way too much even if you like baby spinach). Clean mushrooms and trim the stalks. Set aside. In a large saute pan, heat 1/2 Tbsp olive oil over medium-low heat. Add the chopped onion and reduce heat to low. Season with salt and pepper and saute until the onions are golden brown, around 15-20 minutes, stirring occasionally. Using a slotted spoon remove onions from the pan and set aside. Add the spinach to the hot pan and cook until wilted, a minute or two. Remove spinach from the pan and let cool. Add the remaining olive oil to the pan and increase heat to medium-high. Add the mushrooms top-side down and cook until they start to brown, around 5 minutes. Remove mushroom caps and place, top side up, on a thick stack of paper towels to cool – they will release A LOT of liquid. Refrigerate the onions, spinach and mushrooms until cool. Flour a working surface and rolling pin and roll puff pastry sheet until it’s the desired thickness and length – long enough to accommodate the four mushroom caps. Spread half of the onions in the middle of the pastry sheet, leaving a 3/4″ border on the top and bottom. Place half of the wilted spinach on the onions. Spread dijon mustard over the mushroom caps and season with salt and pepper. Place mushrooms, tops down, on the spinach. Sprinkle thyme leaves on the mushrooms. Cover with the remaining spinach and onions. Carefully, roll the pastry on top of the mushroom mixture, forming a log. Press down on the edges to seal. Turn over and brush with the vegan egg wash. Envelope the log in plastic wrap and place in the refrigerator for at least an hour. Preheat oven to 400F. Place parchment paper on a baking sheet. Unwrap the log and place it on the parchment paper. Place in the oven and cook for 30 minutes. Reduce oven temperature to 350F and bake for 10 more minutes. Remove from the oven and let rest for 15 minutes before serving. Adapted from Nicole’s recipe at Delicious Every Day. 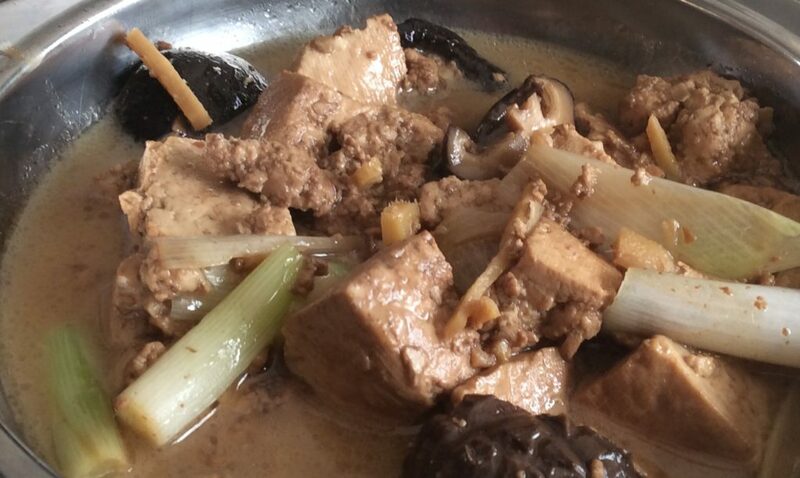 I was making Soy-braised Chicken and Mushrooms for my family, as part of my exploration of Hakka cuisine, and decided to try making it with tofu for my vegetarian daughter. She liked it well enough, though did mention that the tofu didn’t quite absorb the broth and she didn’t think it was as flavorful as she’d liked. Perhaps seitan would be a better bet for this dish. Soak dried mushrooms in hot water for 20 minutes to 2 hours. Remove mushrooms from the water, reserving both. Squeeze out extra water from mushrooms, and cut mushrooms in half. Strain the water through a fine mesh to catch the sediment. Set both water and mushrooms aside. Heat oil over high heat in a wok. Add ginger and garlic and stir fry until the garlic starts to brown. Add tofu and stir fry for a couple of minutes. Add the mushrooms and the mushroom water. Add the kecap manis. Bring to a boil, then bring down heat to low, cover the wok and simmer until the tofu is warmed through, about five minutes. Using a slotted spoon, remove tofu and mushrooms from the pan and set aside. Bring heat to high and reduce cooking liquid until it’s about half a cup. Taste and season with salt and pepper. Add the green onions. Return tofu and mushrooms to the broth, warm if necessary, and then serve. I had some steak and sour cream I had to use up, so I decided to make beef stroganoff based on this epicurious.com recipe. I made a few substitutions, most importantly sour cream for the whipped cream, and the results were excellent. Mika, however, did not like how sour it was, so if I make it again, I’d use whipped cream. Beef Stroganoff is usually served on egg noodles, I used whatever pasta shape I had around. Pat dry the meat and cut into thin, short strips. Sprinkle with salt. Heat the oil over high heat in a deep frying pan. Working in batches, add a layer of beef and cook on both sides until medium rare, about 1 minute per side. Remove beef and repeat with leftover beef. Remove beef, place in a plate, cover and set aside. Turn heat to medium-high and add 2 Tbsp. butter. Wait until it melts and add the chopped onion. Cook until tender. Add the mushroom slices, and sauté until the mushrooms are soft and the liquid evaporates, around 12 minutes. Add the beef broth and stir. Add the brandy, stir and bring to a boil. Turn down the heat and simmer uncovered until the liquid thickens and coats the mushrooms – 10 to 15 minutes. Stir in the cream and mustard. Return the meat to the frying pan, as well as any liquid that accumulated on the plate. Mix and simmer over medium-low heat until the meat is warm, about 2 minutes. Sprinkle with dill and serve over pasta.